Do you have a daily list of 'to do's' that you follow before you can even start to think about exciting new ideas that could change your life? Often we don't get further than the first 2 tasks on the list, ending up disappointed because we didn't have the time and energy to do the things that really matter to us. In this interactive talk, Clinton & Anne-Chloe will dive into the source of this energy in order to reconnect with our energized selves! Join us to celebrate the winners of the Viva La Novella prize! 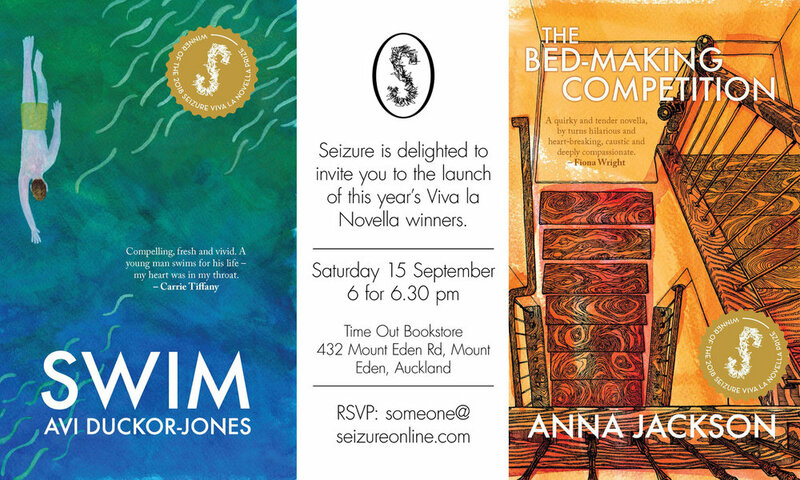 Seizure has announced New Zealand authors Anna Jackson and Avi-Duckor Jones as the winners of this year’s Viva la Novella competition. They are the first New Zealanders in the competition’s six-year history to win. Jackson’s ‘The Bed-Making Competition’ is an ‘intimate and witty look at the joys and strains of family life’, and Jones’ ‘Swim’ ‘is a vital, vivid work on facing the past while being daunted by the future’. Feat: Tayi Tibble, Sam Te Kani, Jamie de Jong, Makanaka Tuwe, Janna Tay and Selina Ershadi. Join us for our 5th installment of All Tomorrow's Poets on NZ National Poetry Day! Embracing new and emerging voices, cutting-edge poetry and multi-disciplinary approaches, All Tomorrow's Poets brings together a community of writers, readers and makers to celebrate burgeoning New Zealand talent and new movements in poetry. Time Out Bookstore, alongside Trigger Marketing, are pleased to be able to host a preview screening of Book Club at EVENT Cinemas Newmarket. Book Club opens in NZ cinemas nationwide on August 16. RSVP Essential. Seats are limited. The pre-teen book club meets monthly to discuss a new book. Today the group will be discussing Miss McAllister's Ghost. Art Nahill is a poet, doctor, and teacher. Stu Bagby is an award-winning poet and editor who began writing poetry while working as a gravedigger on the North Shore. They will be reading from their recently published collections. Nahill's Murmurations, which Glenn Colquhoun says “throbs with the music of human thought" and Bagby's Pockets of Warmth, Stu’s fourth collection, which deals with kin and place. The pre-teen book club meets monthly to discuss a new book. Today the group will be discussing Holes by Louis Sachar. Time Out Bookstore and The Spinoff's Real Pod are extremely excited to be bringing you an event with Married at First Sight AU star, Tracey Jewel! 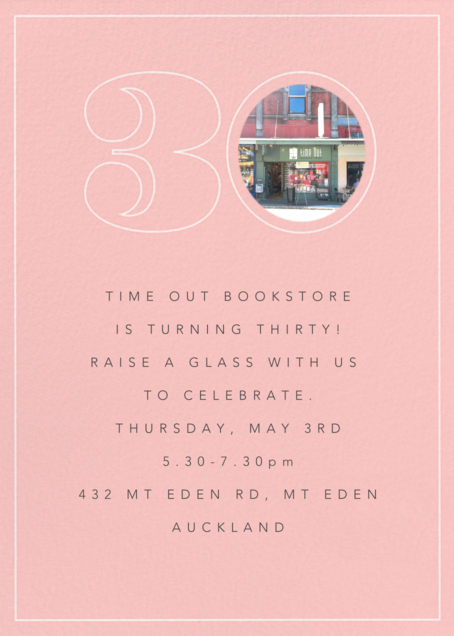 Come celebrate the launch of Jewel's third book "This Goddess Means Business" with the hilarious Duncan Grieve, Jane Yee & Alex Casey. Off the back of her Married at First Sight's rollercoaster ride, Tracey can't wait to share her experiences, book insights and mingle with everyone! The evening includes a brief book reading, Q&A and a signing. Refreshments will be provided, we also have some fantastic door prizes and giveaways on the night! 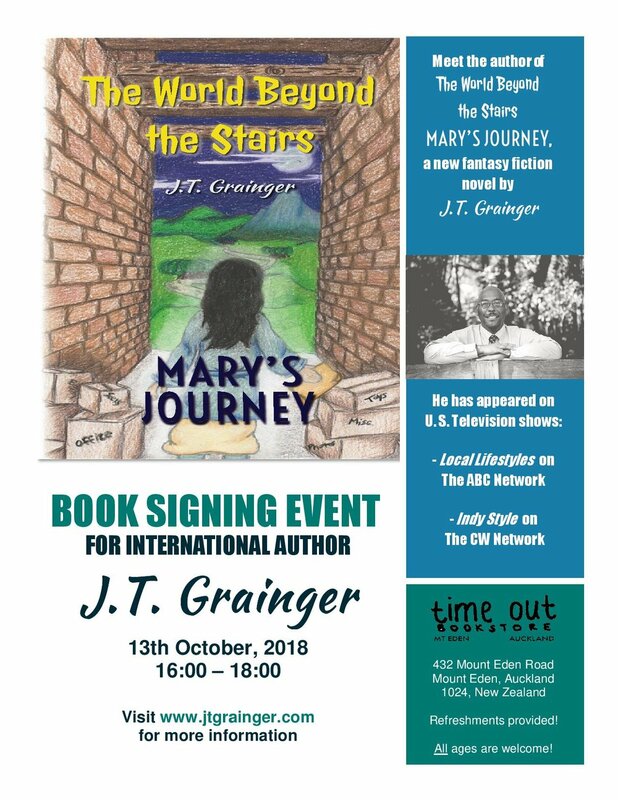 Signed copies available to purchase on the night. Pre-order your copy here. Limited Spaces Available. RSVP to hello@traceyjewel.com. * Get clear about WHO your ideal clients are, what they need, and how you can help them in a massive way. * Learn how to share your unique message in a way that easily attracts your ideal clients. * Be confident in charging what you desire and deserve for your services, so that you become aligned with your financial goals and success. * Make it easy for your clients to find you, and to know, like, and trust you. 50c of every book will be donated to Momentum Forum Events "Kiss Violence Against Women Goodbye"
Tracey Jewel is the author of Goddess Within and Don’t Mess with the Goddess. She is a professional speaker, marketing strategist and reality star from Channel 9s Married at First Sight. She’s appeared on the Oprah Winfrey show in 2011 and is a regular writer for magazines and online resources. Join Miriama as she reads from her new book, The Stolen Stars of Matariki. Behind dusty orange hills, where the sky stretches down to the sea, there's a magical, wild, windy place called Te Mata Hapuku. Sam and Te Rerehua love to visit their Grandma and Poua at Te Mata Hapuku (aka Birdlings Flat). They like to collect agate from the stories, with a backdrop of whipping wind, flashing torchlight, and the splash of Pouas gaff in the water. But one night, Grandma notices something mysterious. Someone has stolen some stars from the sky. And then the patupaiarehe come out to play on the beach... Can Sam and Te Rerehua rescue the Matariki stars? Called “the closest thing to a living saint” by the media, Louise Hay was also known as one of the founders of the self-help movement. Her first book, Heal Your Body, was published in 1976, long before it was fashionable to discuss the connection between the mind and body. In 1984, her new book, You Can Heal Your Life, was published. In it, Louise explains how our beliefs and ideas about ourselves are often the cause of our emotional problems and physical maladies and how, by using certain tools, we can change our thinking and our lives for the better. Louise was able to put her philosophies into practice when she was diagnosed with cancer. She considered the alternatives to surgery and drugs, and instead developed an intensive program of affirmations, visualization, nutritional cleansing, and psychotherapy. Within six months, she was completely healed of cancer. ‘You Can Heal Your Life’ reached the New York Times bestseller list and remained on it for 13 consecutive weeks. More than 50 million copies of You Can Heal Your Life have been sold throughout the world. Twenty years later, due to her appearances on the Oprah Winfrey Show, the book was again on the New York Times bestseller list. The first time in publication’s history has that happened! Louise also started Hay House, Inc., a successful publishing company. What began as a small venture in the living room of her home has turned into a prosperous corporation that has sold millions of books and products worldwide. Hay House authors include many notables in the self-help movement, including Dr. Wayne W. Dyer, Suze Orman, Doreen Virtue, Esther Hicks, Jorge Cruise, Marianne Williamson, Caroline Myss, Cheryl Richardson, Dr. Christiane Northrup, Tavis Smiley etc. These workshops are entirely based on Louise’s healing techniques and positive philosophy. After attending these workshops, millions have learned to create more of what they want in their lives–more wellness in their bodies, minds, and spirits. These workshops can be attended in various formats, the 2-day format being the most popular. It can also be attended over 10 weeks (a 3-hour session/week). Using the same principles, various shorter workshops (3-4 hours) are also conducted which focus more deeply on a single aspect. The Heal Your Life ® Workshop leaders undergo a thorough in-house training and after all the necessary qualifications are met, the graduates are officially licensed and authorized to extend their teaching to others. Currently, there are numerous teachers who regularly conduct these workshops in over 70 countries and continue transmitting the work of Louise Hay. Time Out's Lit Reads Book Club meets every month to keep you in touch with fellow book worms and keep you up to date with the book world. Lit Reads will come together to chat about fresh, exciting titles with special guests. Our next Lit Reads title is Winner of The National Book Award and Women's Prize Shortlisted title Sing, Unburied, Sing. A southern literary-gothic set in the fictional town of Bois Sauvage, Sing, Unburied, Sing explores the relationship between racism and violence in America. Your $10 ticket price will cover wine & nibbles, as well as build a kitty to compensate future guest speakers. Purchase tickets here to RSVP. Hellholes of the World compiles writings over three decades of travel until the author's untimely death. Part memoir, part travelogue, part reportage. Time Out Bookstore, alongside Trigger Marketing, are pleased to be able to host a preview screening of The Bookshop at Rialto Cinemas Newmarket. About the film: Directed by Isabel Coixet (Learning to Drive) and starring Emily Mortimer, Patricia Clarkson and Bill Nighy. The Bookshop is a sumptuous cinematic adaptation which celebrates Bibliophilia itself, based on Penelope Fitzgerald's celebrated novel of 1978. Time Out's 30th Birthday Party! This month, we will be chatting about Frankenstein in Baghdad by Ahmed Saadawi as well as getting a chance to meet each other. We will also announce May's book choice and this will be available to purchase on the night. Registration is open now! Book your free ticket here. See Katy's facebook page for more details. Art, Artists and Pedagogy is written for educators interested in offering children and young people opportunities to extend different aspects of their artistic expression. Written by key international educational figures, the publication focuses on music, drama, art and film from early years to tertiary level. Purchase a signed copy from two of the book’s authors Dr Chris Naughton and Associate Professor David R. Cole. Light refreshments and live music will be provided. Through powerful flashbacks, readers learn of Alexis Marie’s pregnancy with Zachary and his few moments in the world, witnessing how grief touches every aspect of family life, though in different ways. Expecting Sunshine chronicles the struggles and stresses of Alexis Marie’s next pregnancy. She is on a mission to find healing just in time to welcome her next child, yet even imagining giving birth to a baby that lives proves a major roadblock. Along the way, Alexis Marie grapples with her strained marriage, a silent faith, and medical decisions with huge ramifications. Exploring this universal yet taboo type of loss, Chute’s memoir meets the need for personal narrative that addresses the most intimate vulnerabilities of grief and the agony and guilt any mother feels when she cannot fulfill her one most crucial role: to protect her child. Readers will cheer-on Alexis Marie in her clumsy yet noble search for healing, which will be a balm and encouragement for anyone struggling with loss. We’re throwing a canine-friendly Halloween party to celebrate NZ Bookshop Day. Win a Bespoke Bi Monthly Book Subscription! Read something amazing lately? You could be in to win! This is a story that gives hope and practical knowledge for children to help see the positive side of all that is being done for the environment. It is funny and also adventurous.